Technology continues to evolve and make our lives busier and more complicated, but it can never replace true human connection--our fundamental need to share information, stories, and emotions. 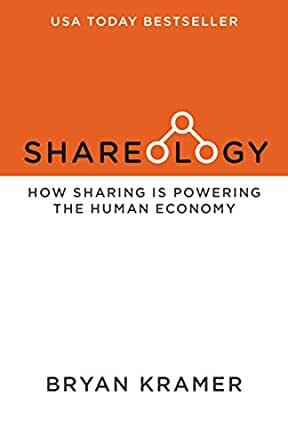 Kramer's best-selling second book, Shareology raced onto the USA Today's Top 150 Book List the week of its release, as well as onto #1 on Amazon in four categories including Business & Planning, Strategic Planning, Hot New Releases and Communications, and Business Best Sellers Top 25 and Jack Covert Selects list on 800 CEO Reads. The Sharing Future: What's Next? Bryan Kramer is a renowned global speaker, consultant and trainer. He's also one of the world's foremost leaders in the art and science of sharing, and has been credited with instigating the #H2H human business movement in marketing and social, which was the basis for his first book: There is No B2B or B2C: It's Human to Human #H2H ~ another Amazon bestseller. Bryan Kramer is a social business strategist and CEO of PureMatter where he's led his agency to consistent growth over the last ten years, earning a spot as one of Silicon Valley's fastest growing private companies by the Silicon Valley Business Journal. The author of the bestselling book Human to Human: #H2H, he has extensive experience in brand marketing with a focus on integrated communications and strategic business planning. With more than 250,000 social followers, Bryan has quickly become one of the country's leading authorities on social and digital media, speaking internationally on a variety of topics. As an active blogger and author, he has built a community of over 20,000 readers to his syndicated network each month. He also hosts "From the Author's Point of View" author podcast series, as well as #Substance, PureMatter's Luminary Video Series. He is a featured contributor on SocialMediaToday.com, Business2Community, and the IBM Smarter Commerce blog. 5,0 de 5 estrelasThis Book Could Have Saved My Career; Require Reading for the C-Suite, and Everyone Else. As someone who was an early adopter of social media, long before it was mainstream, and as someone who has struggled in a variety of corporate roles to prove the value and worth of the medium, this book is finally the "credibility" for those of us who are natives or naturals, and just instinctively "get it". Bryan Kramer writes the required reading for every C-Suite executive. 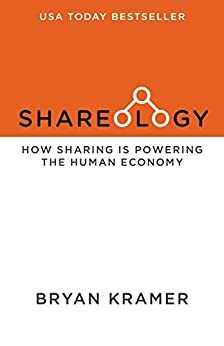 This book will save companies a lot of money by helping them understand their purpose and their "Why" for using social media and understanding the entire H2H (Human to Human) economy of sharing. I have regularly given clients, bosses, investors, and others, books relating to the new digital media and social networks, sharing platforms, those books were the closest thing to explaining what those of us in the trenches are doing. Now the perfect book is here, and Bryan makes it accessible for everyone, no matter your experience level, age or understanding. The first portion is practical, relatable, and accessible for the professional, the neophyte or the doubter. The second portion of the book is a collection of great examples of use case, analytics and social proof. Understanding that the basis of social marketing and digital marketing is about sharing, caring and helping others, and humanizing the brand whether a corporate brand or personal brand. Beautiful explanations of the etiquette of social channels, behaviors, expectations and crisis management planning are all included. I especially appreciate the "crisis management" portion, because understanding how to "shut down automation" and when the appropriate time to do so is, is something that so many brands miss. Shareology explains what you need to know to be prepared, to engage, to participate and to prepare to succeed in digital marketing. This should be required reading for Parents, Students, Teachers, Professors, Professionals, oh let's just say everyone. Sharing is caring, understanding your why, and the why is so important. Kudos to Kramer!! I look forward to the next book! 5,0 de 5 estrelasPerfect for the workplace or business owners! Absolutely loved this book! It really focuses on the human nature of interaction instead of the technology based society we've come to be. I think sometimes it's really important to step back away from all your devices and spend quality time with people, since face-to-face interaction is so much more enriched than via phone or e-mail. This specifically focuses a lot on the workplace and how to improve your interaction while there to be a better worker, manager, etc. It's especially perfect for entrepreneurs because getting the word of your business out there is one of the most critical components to running your business. Really great book! 5,0 de 5 estrelasIn our technologically connected world Bryan Kramer reminds us to get back to basics. 1. Dale Carnage's legendary decades-old book, "How to Win Friends and Influence Others." 2. James Kouzes and Barry Posner's "Encouraging the Heart: A Leader's Guide to Rewarding and Recognizing Others." 3. Gary Goldstein's "Conquering Hollywood: The screenwriters blueprint for Career success." 4. Peter Elbow's "Writing with Power: Techniques for Mastering the Writing Process." 5. Steven Covey's acclaimed "The 7 Habits of Highly Effective People." 6. And my personal favorite, since I write a blog and try to connect via writing and pictures, is Lisa Cron's "Wired for Story: Brain Science to Hook Readers from the Very First Sentence." All of these books "share" one crucial human need, communicating from the heart. While Mr. Kramer's book appears to be using Social Media (aka as the Internet, email, and powerful multimedia tools) as his primary message, readers will get a quality surprise to the contrary. His primary theme in Shareology is still quality CONTENT based on human to human connectedness. It's not a one-way street nor people coming out of the woodwork because leaders or marketers are gurus. According to Kramer, and other 21st century social marketers, the good old-fashion advertising days have been over for years. Thank goodness. Here is how it works: With person A sharing quality content to person B, person A and B have already established a relationship based on previous content. So, person A knows person B so well person A's content does not just tell a fascinating and interesting story, but tells person b's fascinating and interesting story. Dale Carnegie was the first thought leader on this simple insight into marketing and making friends, knowing and listening to people, and talking about them with the technology available in his time, person-to-person. We are fortunate to have powerful media tools at our disposal on our laptop or mobile device, which can reach out to thousands of people in seconds. But does our content connect? Does it mean anything? Does it resonate? Does it tell a story, or better yet, does it tell their story so your friends, colleagues and members of your community can help others? Mr. Carnegie would be happy with the author's message, relationships based on heartfelt stories. Kramer wisely quoted Jay Baer when he writes: "content is the match and social is the fire." But the "match" is crucial and the hardest to teach and learn, social can be learned and enhanced by the multimedia tools at our disposal. Without the "match," however, social media and all of those powerful social media technology are useless. Content is best constructed from solid, long-term relationships, knowing people, and writing or verbally communicating, people will want to share their story what is essentially from your content to their community. The author used the "wave" to illustrate this contagion and how each fan wants to participate with thousands. Quality content has to be so well constructed and curated person A's readers and customers will think it's their own idea. We want them to own it, to share and to help others. That is magical. The author's strength resides with small and medium business, helping them into being "more human" organizations. For the small business owner who looks for challenges and company boost, this book is for you. Success is enhanced by connectedness enjoyed by your team. Kramer’s sharing ideas might be easier to implement with small organizations as the primary environments where his ideas might work best. "The Sharing leadership" is one of his best examples and how organizations can utilize their energies where everybody participates and grows with the organization. People working together are in physical proximity every day, thus, making those relationships stronger, deeper and more valuable. It's not only good for the employees, it's great for business and the customers. The challenge will be the internet in which we will not personally meet hundreds or thousands of people (and as the business model itself evolves as more people will work from home). With millions of blogs in our social media world, it will be interesting to see how his ideas manifest with individuals, groups and communities worldwide. There are hundreds of millions of blogs, Facebook Walls, Twitters, etc. for example, and each has a unique story with followers and their stories. The human to human sharing will always be in our DNA. But how it looks beyond text, audio, video or pictures we use in social media will still be the test. Future generations will laugh at the limited features of our current multimedia tools, just as we are fascinated at the limitations when driving a 1953 Oldsmobile Eighty Eight or making sense of DOS 1.0. On the other hand, we still have a long ways to go and perhaps we are leaning too much on technology. During the dark ages of 1997 in our burgeoning internet world, Janet Murray's published an amazing futuristic critique of how we will read, comprehend, interact and participate in literary works. In her technological treatise "Hamet on the Holodeck: The Future of Narrative in Cyberspace," she illustrates how futuristic tools in which readers interact with the characters or recreate their own story, characters and their ending. 18 years later her fantastic ideas are not ready for prime time, nor in the foreseeable future. This doesn't bother Kramer. He cuts through alluring technological distractions by connecting with people by sharing. Human beings still count. So what are we waiting for? Many of us understand heartfelt intentions, but too often keep them to ourselves. This reminds me of the end of the Wizard of Oz movie when Glinda the Good Witch said, "You had the power to go home any time by clicking your heels, Dorothy." Dorothy was told by Glinda those ruby slippers are powerful, but Dorothy never used them till she was informed by Glinda again. Thank you Mr. Kramer for being our "Glinda," reminding us again it's the human connection (and always has). Thank you Michael Stelzner (Social Media Examiner) for interviewing Bryan and "sharing" on your podcast.